When hiring a contractor to build, renovate or remodel your home, you hear that you should ask if they are licensed and bonded. 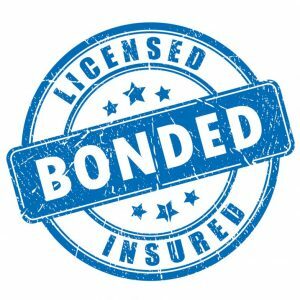 But what does licensed and bonded mean? A license is required to perform any type of skilled labor on another person’s home or property. Specific trades like a plumber or electrician must be licensed in their field. Those performing a variety of projects may be required to obtain a general contractor’s license. Each state may also require examinations for different levels of classification, or that the contractor have active worker’s compensation insurance and be bonded. To be considered bonded, a contractor must purchase a surety bond, a type of insurance policy that protects the homeowner. Money is set aside with a bonding company and available to the consumer in the event they file a lawsuit against the contractor or their company. If a contractor fails to complete a job as required or contracted, the bond can provide compensation to a property owner or pay someone to come out and complete the work left by a contractor. The surety company then goes after the contractor for reimbursement of the full amount. To get bonded, a company or contractor’s record of work history, credit history and other factors are reviewed by the surety company, who feels secure in granting a bond. If a contractor is working without a license, they are breaking the law. There is also a good chance that they are skimping in other areas as well: they may not be obtaining required permits and inspections. This can result in your project not meeting code requirements and aside from creating safety hazards, you may be required to fix or tear out items not up to code if you go to sell your house. Warranties can also be voided if items are installed by an unlicensed contractor. You may be putting yourself in harm’s way by using an unlicensed contractor if something should happen to the contractor on the jobsite. You would be liable for insurance coverage for their injury and could subject yourself to a lawsuit. At Först Consulting Group, we want to make sure homeowners and consumers are informed about best practices in the homebuilding and remodeling industry. That ensures fewer problems down the road. If you have questions about hiring a contractor for your building project and need help negotiating a contract, hiring a construction company, or ensuring they are licensed and bonded, contact Först. We provide a range of homeowner services to help and protect you. Contact us today. What is a Green Home? →← How Much Does a Home Repair Cost?